Library, Harvard University. 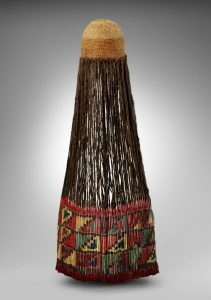 Web source: Tribal Arts Magazine (click image for web page). Thus, I came to learn that Marie Jeanne Adams changed her surname at some point in her life after publishing The Harriet Powers Pictorial Quilts in Black Art, the possible reasons for which remained a mystery according to tributes published after her death. A petite woman of exceptional presence and personality, Monni’s incisive wit, energy and vitality were extraordinary and left an indelible impression. 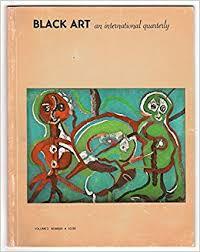 She had already reached the age of 59 when she published the essay I refer to here in 1979, long before I met her, and she never ceased contributing to the fields of anthropology and art history through her teaching, curatorial accomplishments, field research and writing. Her last paper was published in African Arts at the age of 91; she died on December 24, 2014. I was greatly pleased to have this renewed connection to Monni Adams by way of Harriet Powers and her quilts, and a chance to further explore the MFA’s textile treasure through an illuminating study. Adams’ classification of the quilt, in an essay written forty years ago, proves itself inadequate by her own admission, as we shall see later. Needless to say, my real intention here is to follow her thought process as one person seeking to comprehend and interpret the object itself through the mind and hands of the maker, Harriet Powers. …and in the following four images, Adams looks closely at the maker’s visual vocabulary by pointing out communicative details, such as spikes of frozen breath of the mule (#11); the choice of gold metallic thread to outline the figures of Bob Johnson and Kate Bell (rich sinners, according to Powers), elaborated in a series of loops to depict a crown on Kate’s head (#13); and blood and water streaming from the side of the crucified Christ conveying a visceral experience of horrific suffering (#15). Detail, quilt block #11: “Cold Thursday, 10 of February, 1895. A woman frozen while at prayer. A woman frozen at a gateway. A man with a sack of meal frozen. Icicles formed from the breath of a mule. All blue birds killed. A man frozen at his jug of liquor.” ~Harriet Powers (Click image for fuller detail of this quilt block.) Photograph © Museum of Fine Arts, Boston. If Betts stands as a symbol for the human struggle for freedom and the possibility of a long and hard-won journey to independence—then I observe, in higher relief, the subtle line of bright orange fabric surrounding the contours of the hog. Powers placed two layers of fabric together (laying the brownish fabric over the orange layer), stitched the outline of Betts’ body within the cut edges of the two layers, and then, with calculated attention and patience—not unlike her painstaking rendering of celestial bodies—the maker carefully trimmed the edges of each fabric layer close to her line of stitching, starting with the top layer. She chose to trim the orange layer quite close to the first, leaving just enough to reveal a glowing sliver of incandescent radiance: a clue that Betts the hog is no ordinary farm animal. 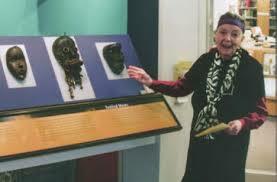 Monni Adams (1920-2014) with one of her masks (personal collection). Web source: The Boston Globe; Photo: Photo by Rose Lincoln/Harvard Staff Photographer. Click image for web page.